This post is courtesy of our contributor Michelle…Looking for a fun and easy alternative to traditional cake for your Halloween party? 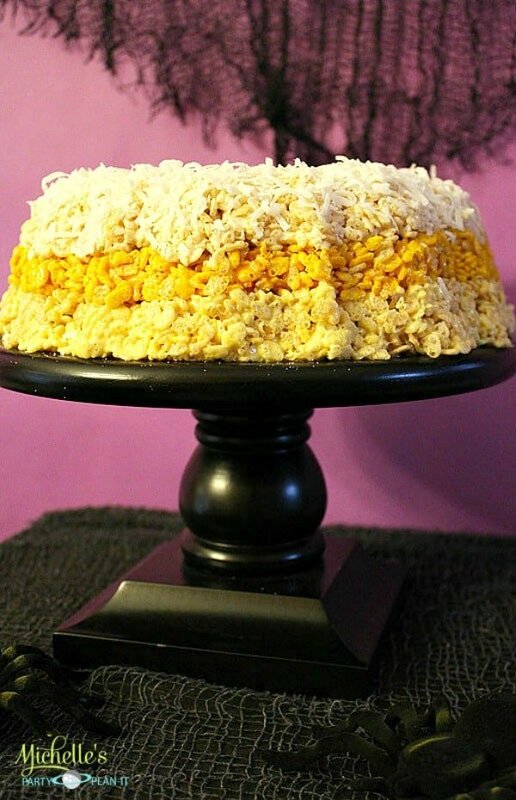 How about making a Candy Corn Cereal Treat Cake? I made this treat a couple of years ago for our House of Spooks Halloween Party and thought it would be a fun recipe to share with you all for Party Tip Tuesday! Directions: Following your favorite cereal treat recipe (my favorite is the original Kellogg’s recipe), melt the marshmallows and butter in a large pot. Once melted, remove from heat and divide it evenly into 3 mixing bowls. Quickly add a few drops of orange food coloring in one bowl and yellow in the other, one bowl will not have any added food coloring. Quickly add 4 cups of cereal in each of the three bowls of melted marshmallows and stir. You have to do this very fast, you do not want the marshmallow to get hard. Spray the bundt cake pan with non-stick cooking spray. Starting with the cereal mix that you did not color, spread the mix evenly in the bottom of the pan to make your first layer, make sure to smash it down evenly. Then add the orange cereal mix. Repeat with the yellow mix as your last layer. To remove the cereal treats from the pan, place a large plate on top of the bundt pan. While holding the plate and pan, flip it over and shake. You may have to shake it a bit to get them out. You can then slide your cake over to a Halloween themed cake plate or serving tray. For the topping, just sprinkle the shredded coconut on top. And that’s it! 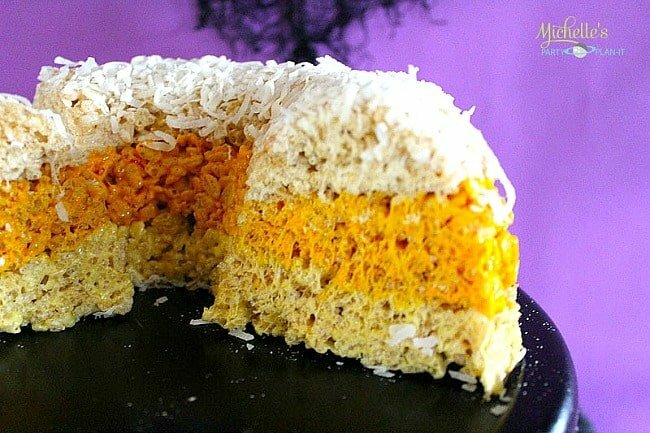 Easy Candy Corn Cereal Treat Cake – slice and enjoy! We’d like to extend a big Thank You to Michelle for sharing this delicious recipe with us. Follow Michelle’s Party Plan-It on Facebook, Pinterest and Instagram for even more creative & unique ideas for parties!